Water pumps wear out through age, through lack of lubrication on older types — which need greasing — or because the drive belt is too tight. This is the water pump and drive layout found on most cars. The pump is mounted on the front of the engine and is driven by a belt which also drives the alternator. 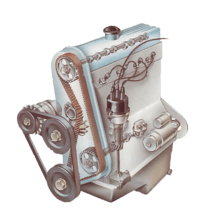 A worn pump may leak around the spindle, in which case there are leak trails down the front of the engine and a slow loss of coolant. The pump may also rattle as it turns — do not confuse this noise with the screech of a loose, slipping belt. To check for wear, loosen the belt and, if a mechanical fan is mounted on the pump, grasp opposite blades and try to rock them. They should not move more than a small amount. If the fan is not fitted directly to the pump, clamp a self-locking wrench on to one of the pump pulley bolts and rock that. Replace a worn pump. Buy a new gasket too, and some gasket sealant. Examine the radiator and header-tank hoses for splits or signs of perishing. Replace, along with the clips. Disconnect the battery. Drain the coolant, saving it if it contains antifreeze. Catch in a clean container and filter through muslin before replacing. Check the strength (See Checking and topping up car antifreeze coolant). Disconnect the hose(s) from the pump by loosening the clip and gently twisting the hose to and fro to free it. There may be other parts you need to remove to reach the pump. On some cars you must take off the radiator to get at the water pump. On some cars you must take out the radiator to reach the pump. They include the Talbot Avenger and BL Maxi. On the original mini you need not, removing only the top part of the fan cowl allows enough access. When replacing the pump on a Mini it is advisable to replace also the bypass hose. Unless it is in perfect condition - it is difficult to reach with the pump in place. 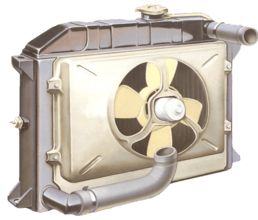 On early Minis the pump can be reached by removing the top part of the fan cowl. The talbot Alpine has a pump reached by unbolting a side panel under the front offside wheel arch. Remove the wheel to expose the panel. On some cars you must take off the radiator to get to the pump. Slacken the drive belt by loosening the generator. Remove the fan belt and its pulley. Slacken the drive belt. Unbolt the fan (if fitted) and pulley from the pump hub. Mark the side of the fan which faces the radiator: it only works properly one way round. Some pumps have a drain plug. Unscrew this to insert it in the new pump. Remove the pump retaining bolts. Some may be longer than others. Note which bolt goes the pump where - it is important when refitting. Use a socket spanner and extension to remove the pump retaining bolts. 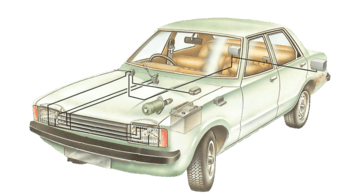 Note the position of each bolt if they vary in length. Pull off the pump carefully. If it sticks do not lever it away from the engine block with a screwdriver, because you might damage the block and cause a leak. Scrape the remains of the old gasket off the block with a piece of wood. Fit the new gasket (smeared on both sides with sealant, if used) and the pump. Tighten the bolts in diagonal sequence in order to avoid distorting the pump flange. If the pump is stuck to its mounting by gasket sealant, free it by tapping gently with a soft-faced hammer. There may be a recommended torque setting for them - consult a service manual if in doubt. Refit the hoses and tension the belt (Checking, adjusting and refitting drive belts). Refill the cooling system. Run the engine up to normal temperature and check for leaks. On some old cars, such as the Triumph Dolomite Sprint and Saab 99, the pump is mounted vertically at the rear of the engine block. The water pump on the VW Golf is driven by the camshaft drive belt.